The 2016 Euromoney conference kicked off in Cairo on Monday, gathering about 800 international and Egyptian business owners, together with top governmental officials. The two-day event, held in Semiramis Intercontinental in downtown Cairo, has a number of crucial topics on this year’s agenda that focus on Egypt’s economic future. This year’s event is largely focused on the impact of the USD 12 billion IMF loan agreement Egypt has reached, how the government’s economic reform policies will affect ordinary Egyptians – particularly after the value-added tax (VAT) – and investors’ major concerns regarding the central bank’s approach to a currency devaluation. Current challenges such as the budget deficit, high inflation rates and the depletion of foreign reserves were also at the top of the agenda. ”During the past five years, foreign investors were still worrying how the Egyptian market will be performing. 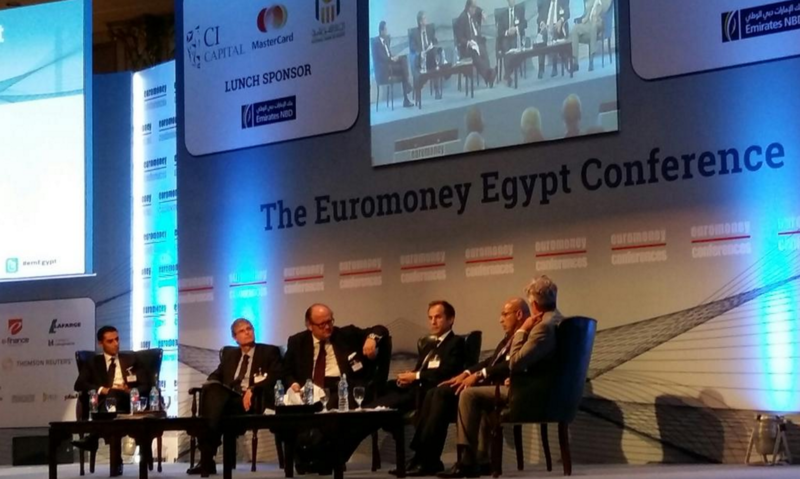 This year, as a foreign investment institution we are witnessing clear economic program in Egypt which sends positive vibes to foreign investors and a clear message about the next steps taken by the Egyptian government regarding fiscal, monetary and investment policies,” said Christopher Garnett, the Director of Euromoney Conferences. The IMF support to the government reform program is aimed at plugging a budget gap and rebalancing the currency markets. Asking whether the IMF loan agreement was the “magic solution” to the current Egyptian economic challenges, Minister of International Cooperation Sahar Nasr said that the government, the private sector and Egyptian citizens must all commit to the reform plan for it to work. “Our current policy is the inclusion of all segments from public sector, private sector and the SMEs [small- and medium-sized enterprises], who participated by 90 percent in the private business,” Nasr added. The minister said that the country’s current borrowing policy is focused on achieving clear-cut results by earmarking the money to all consuming sectors that have a strong impact on low-income Egyptians, such as projects for sanitary, electricity and affordable housing. Nasr also said that addressing Egypt’s budget deficit and foreign currency shortage from secured funds is the main goal. Egypt has secured agreements with the World Bank (WB) and the African Development Bank estimated at a total of USD 12 billion: USD 8 billion from the former and USD 4 billion from the latter. The implementation of VAT, which was a requirement for the IMF to approve its loan to Egypt, has stirred debate in the Egyptian market due to concerns regarding the expectedly high inflation rates that might hit commodity prices. For his part, Minister of Finance Amr El Garhy said that 90-95 percent of food commodities, in addition to the health, transportation and education sectors, are exempt from the VAT. El Garhy added that the current policy is to collect taxes from those who do afford paying to give those who are needy. In the context of empowering the low-income Egyptian, the minister said that the government has launched a database for all segments to help subsidies reach the right citizens. Financial support has been allocated to 2 million Egyptians to guarantee them a dignified life through a social governmental program. Meanwhile, the topic of the potential devaluation of the local currency was a hot topic during the conference, with investors giving varying outlooks on the syndrome of the dollar/pound exchange rate. Chief Executive of NI Capital Ashraf Ghazaly said that the Central Bank of Egypt must take rapid action to tackle this issue, as the current exchange rate is not providing sufficient liquidity to allow public enterprises to keep their businesses afloat. According to an online survey released prior to the start of the Euromoney conference, 55 percent of Egyptians see that dollar will hit EGP 11, 20 percent expect it will hit EGP 13 and 18 percent see that it will hit EGP 9.5.